And there'll be yet another issue at play. The accident report states that on the penultimate flight, before takeoff the Pilot in Command had discussed the - just completed - AoA replacement with the maintenance engineer. At takeoff, during rotation (as the aircraft left the ground) his stick shaker activated. At 'flaps up' Indicated Airspeed and Altimeter Disagree warnings, and Elevator Differential Pressure warnings appeared on the PIC's display. The (unmentioned) jumpseat pilot noticed the aircraft was automatically trimming nose down (after Speed Trim should have stopped) & recommended disabling the Trim system. PIC did that - which seemed to work. He then read some fault Checklists and none contained the instruction “Plan to land at the nearest suitable airport” so he continued with the flight, the co-pilot flying with the Pilot's stick shaker still rattling, warnings still active on the pilot's display. There must have been a lot of pressure on this pilot to press on and avoid a costly schedule disruption. In that case they landed safely. The pilot noted the Airspeed problem, Altimeter problem, Feel Differential Pressure problem. Maintenance serviced the Pitot tube system, cleaned a plug on the elevator pressure system, tested and found no faults (of course). Next flight the same aircraft crashed. Sure seems (to a layman) that a series of issues like that - in a new aircraft - literally setting off alarm bells, should have required a test flight after repair? If not, the next crew should have been informed of the 'solution' to the previous flight's problem? If I was on an Air New Zealand flight, and there were major control problems (on the first flight after maintenance), I'd hope the Pilot in Command would make the decision to land the malfunctioning aircraft immediately. Another interesting article. It was 'Go go go' to get the Max programme up and running, employees allege all kinds of shortcuts. Read the comments too. Among the usual 'Stuff standard' comments there are some really worth reading. The pressures were probably not just to keep to the schedule.There can be cultural pressures as well. Like loss of face for not landing at the destination. It dosen't get front age news here, but there are often runway over runs and similar accidents in that part of the world due the the press on attitude brought about by cultural pressures. I would never recommend anyone flying on certain airlines for this reason. Your notes on the pre accident flight bring up interesting points. The stick shaker as I understand it isn't part of the MCAS system, yet it was operating when it shouldn't have. However I believe the MCAS and the stick shaker system get their informtion from the same source. The fact the MCAS was triming the aircraft and the stick shaker was operating makes me think the problem isn't with the MCAS system but with the data provided by the Angle of Attack vanes. These vanes were already fitted to previous models so they are nt unique to the Max. That's not to say the actions of the MCAS system wasn't introducing some confusion. However in my mind there is no explanation for not using the Cut Out switches to disable the automatic trim. When a system isn't giving you the response you expect, turn it off. That article doesn't acknowledge Boeing had been working on plans for a 737 re engine project for quite some time. It was called the 737 RE project. Boeing's preference was for a clean sheet design but they hedged their bets by having a "stalking horse" and were working on the possibiity of re-engining the 737. A new design was going to take much longer and when it was clear they needed an improvement over the older 737's sooner than an new design could be produced they resurrected the work on the 737 RE. That's why they were able to have the work done so quickly. I think talk of corner cutting is an exaggeration. Bear in mind there are a few disaffected ex Boeing employees. There may be an element of truth in some of what they say, but their comments have to be viewed with the knowledge they may have an agenda. The article also is wrong on what the MCAS system does. My understanding of it is it isn't there to prevent stalls, thats the job of the stick shaker and other systems. The MCAS system is there to help augment control stick forces in certain phases of flight. It's not unusual for aircraft designers to implement some type of control force augmentation, though the MCAS system is different from many in that it is dynamic rather than static. Please bear in mind I'm trying to put this in laymans terms and I haven't necessarily used technically correct descriptions. The more I read about the 737 Max problem, the more I think Boeing will be shown to have designed it properly. They could have and should have been more open about how the MCAS sytem worked. I think the 737 Max is a sound design and history will show that to be the case. Anyone remember the A320 crash into the forest on the go around from a low pass at an airshow? I wonder that the main part of the problem is with the Angle of Attack sensors and or the maintenance/calibration of them. A bit in the same way the pitot heat system on the AF 447 Airbus was found to be deficient. Interestingly that accident didn't need to have ended the way it did if the pilots had applied some basic flying 101 principles. In my mind there is no doubt there is deficiencies at the airline level (pilot training and possibly maintenance/calibration). I think the blame will be spread around with Boeing making some changs to the system as their part of accepting blame and airlines will be directed to improve their training. Technofreak: That's not to say the actions of the MCAS system wasn't introducing some confusion. Yes... the stick shaker means push forward because the aircraft is in a stall (typically excessively nose high), but the aircraft is diving (nose low). You would be struggling to reconcile these two contradictory facts, and why it's only the captain's stick that's shaking, and then figure out that the dive is due to the plane (MCAS, which in the case of Lion Air you don't know about) responding to the false reading from the AoA sensor, which is also (I assume) what's causing the stick to shake. And then figure out that killing off the MCAS by switching off the trim will make one of these problems go away, and you can manually fly the plane (without trim, and with the captain's stick still shaking). I can see why, on the preceding Lion Air flight, the third person in the cockpit came up with the solution. One pilot would be trying to fly the plane, the other looking up the checklist, with neither having the space to think about the underlying cause. I largely agree with your post, but I have two comments. You can still trim the aircraft with the electric (automatic) trim turned off. There is a manual trim wheel fitted to the 737 for that express purpose. There is no need to fly without trim. There should be no need to look up the checklist to know what actions to take in the event of a trim problem. These have been memory items any any aircraft I have flown. In my opinion if you cannot remember a basic action like this I'd have to question whether or not that person should be sitting in one of the two forward facing window seats. I'd also hazard a guess there is a memory item for a false stick shaker activation as well. The system described is inflight wifi. It is fitted to Boeings and Airbuses alike. The fault could have been in any number of components, including the satellite server. 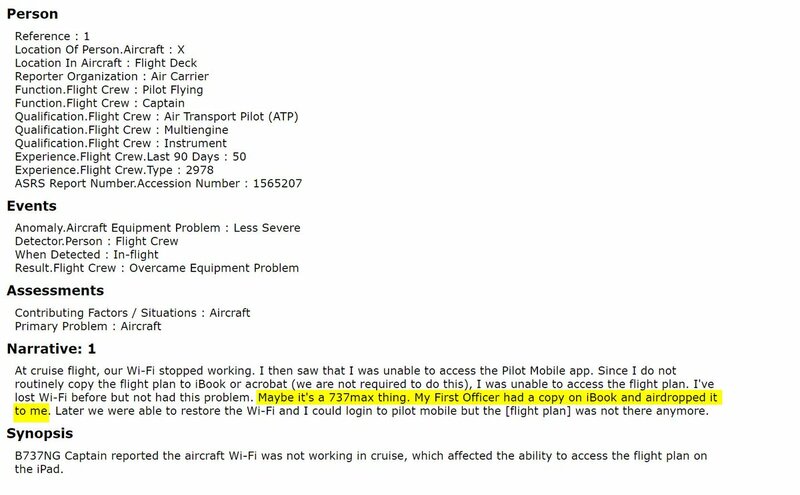 As for the flightplan on the iPad, it is not physically connected to aircraft flight control or navigation systems, so hardly rates a mention in the subject of this thread. I waited years before getting on a B787 because of the battery issues & then RR engine issues. It will be years before I book a flight on a B737 MAX if ever. 'If it's not an older Boeing, I ain't going'. I imagine the leader of the free World will be perfectly content to keep on flying on the old Air Force One planes for another 5 years, assuming he gets re-elected. Seattle Times: After the Lion Air Flight 610 crash, Boeing for the first time provided to airlines details about MCAS. Boeing’s bulletin to the airlines stated that the limit of MCAS’s command was 2.5 degrees. Long article. Short story: FAA has become like FDA. Outsourcing to manufacturers. Incomplete information provided to FAA caused regulatory fail. With complete information this system would be classified high hazard and require redundancy. This didn't happen. High hazard system no redundancy killed people. I guess they do this to influence Governments and airlines to purchase Boeing rather than Airbus but it must make their programmes harder to control. There's enough in that Seattle Times article above to start a major suit against Boeing for non-compliance with regulatory filing requirements. No doubt it will be defended as these things usually are at least for a time.